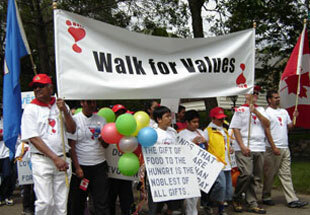 In the July 15th, 2004 issue of H2H we carried a report on the Walk for Values organized in 2004. 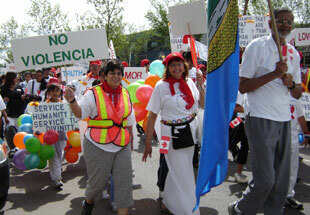 It was the Sathya Sai School of Canada’s second annual walk held in eight cities of Canada including the capital city of Ottawa. To read that write-up again go here. And now we have the report of the latest endeavour from Canada, in June 2005. When there is sincerity of purpose….God’s grace is always there... and ideas begin to flow… read on. 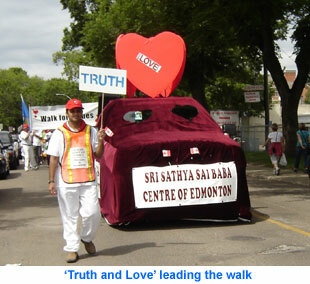 The Sri Sathya Sai Baba Centre of Edmonton hosted their very first Walk for Values at 11am on Saturday, June 25, 2005 in a very busy location of Edmonton, close to their Centre. 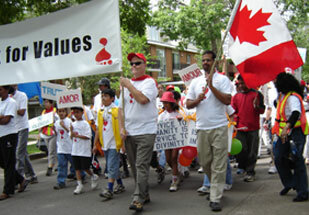 The Walk for Values is a national project initiated by the Sathya Sai School of Canada in Toronto, as already mentioned. The purpose of the Walk every year is to raise Awareness of the Human Values and make the community a better, safer place to live. 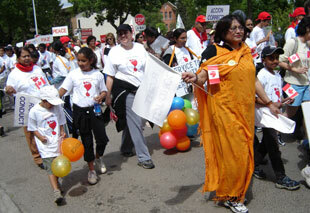 “The weather was perfect and our members and guests, excitedly gathered together for the 4.5 km walk. We had approximately 160 people participating in the Walk, including members from other spiritual organizations and religious groups and the public. A father and son on roller skates passing by spontaneously joined the Walk right from the start stating that this was a "great idea". 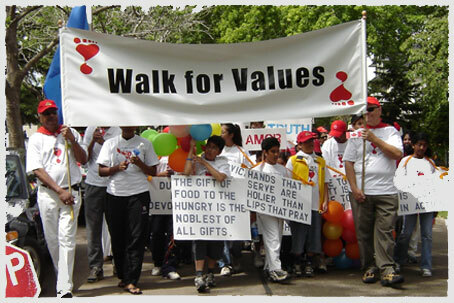 Many wore white T-shirts with the unique 'Walk for Values' logo, and a sticker on which walkers pledged to practice a value of their choice, as a personal commitment to transformation. The popular ones were very inspiringly 'love', 'patience' and 'forgiveness'. 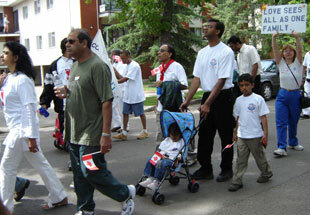 Unlike other Walks, no money was collected for registration or participation. 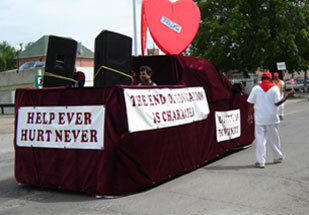 We were led by a float with a sound system playing recordings of value songs through residential and business areas and a marketplace. 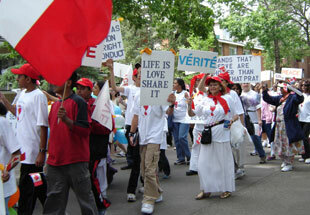 Our cheerful group of walkers held up banners and flags publicizing the human values of love, truth, peace, right conduct and non-violence in 3 languages, English, French and Spanish. Seniors, children and babies in strollers made the Walk so much more pleasurable. People spontaneously showed their support, motorists honked approval of the messages on our banners; others came out to their apartment windows and their front gardens cheering us on, asking about the Walk and the Sai Centre. 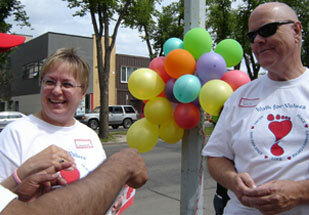 Since it was the week before Canada Day we distributed small Canadian flags to children and onlookers. Our guest speaker was Ms. Yvonne Racine, a Minister from Unity Church. Yvonne spoke with admiration about the teachings of Swami, and the need to build our nation on the strong foundation of Values. 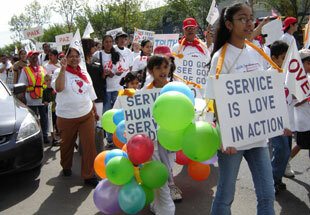 She stated that she would gladly support any future public effort by the Sai Organization to promote Human Values. We ended the event feeling a sense of joy and accomplishment in that we shared with the public our personal commitment to Sri Sathya Sai Baba to uphold His teachings of Love, Service and the Human Values. 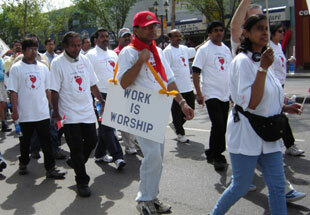 With Sai Baba's Loving Guidance this Walk was a great success. And the H2H Team wishes you all the very best from Prashanthi Nilayam.